When you think of nuns, you probably think of proper religious women who don’t seem to have much fun. Sisterhoods have a reputation for being rigid, rather than allowing ideas to flow. They are thought of as being entirely dedicated to traditional forms of study, never letting their energy break loose. These sisters are out to break down all your stereotypes about nuns. The sisters decided to get together and show that not all who are devoutly dedicated to their religion have to forego the pleasures of having good, old-fashioned fun. They reserved a local entertainment space and got ready to put on a show. 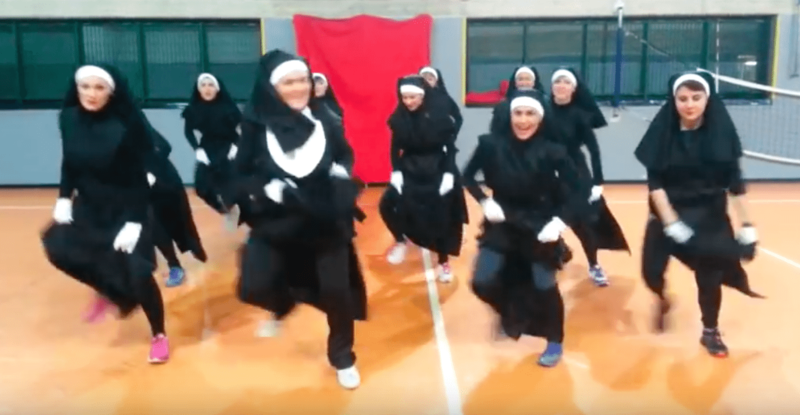 The nuns choreographed their very own zumba routine! In a stunning rework of traditional hymns, they created a catchy song that they couldn’t wait to tap their feet to. They started out slow, but they had a big surprise in store for the audience. Their outstanding performance will leave you smiling for the rest of your day. At the beginning of the song, the sisters made subtle movements, slowly shuffling their bodies to match the music. As the notes picked up, however, their bodies broke out of their stiffness and began to flow with the rhythm. The performance seemed peaceful and serene – until about halfway through. Suddenly, these sisters came to life. The beat kicked in and their feet started tapping. They excitedly jumped back and forth to the repetitious chant “I love Him!” with big smiles on their faces. The song was really kicked into second gear now. The sisters fully extended their arms, creating a magnificent effect with each sweeping motion. 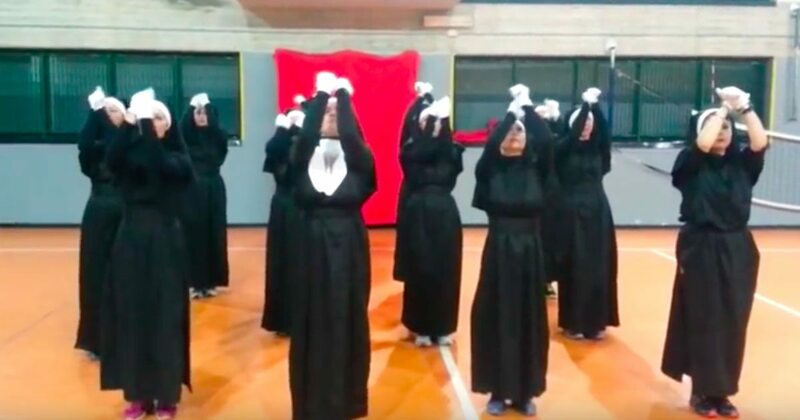 They audience was hypnotized as the nuns shuffled and shimmied to the song. 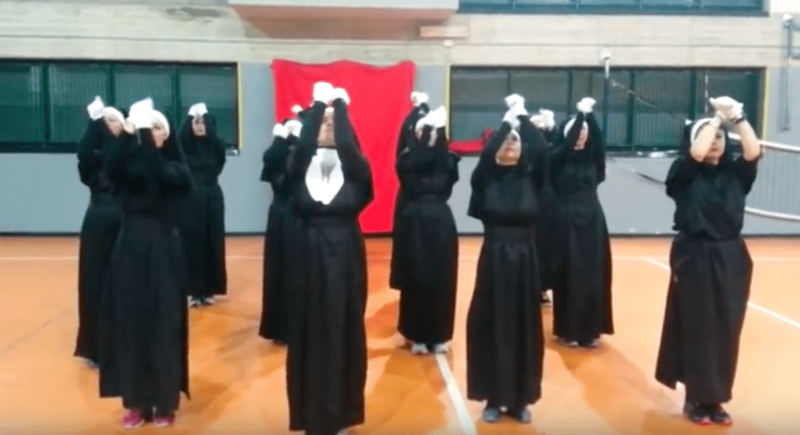 The best part of the whole performance was the energy the nuns carried as they grooved to the rhythm. Since they were all varied in age, it was even more wonderful to see them all come together and bring their full energies to the dance floor. What started out as a normal-seeming routine quickly became a surprising performance full of thrills. These nuns certainly proved that you don’t have to give up your vitality in order to work on your religious self. These sisters worked their butts off to put on an exciting performance, and their hard work paid off. 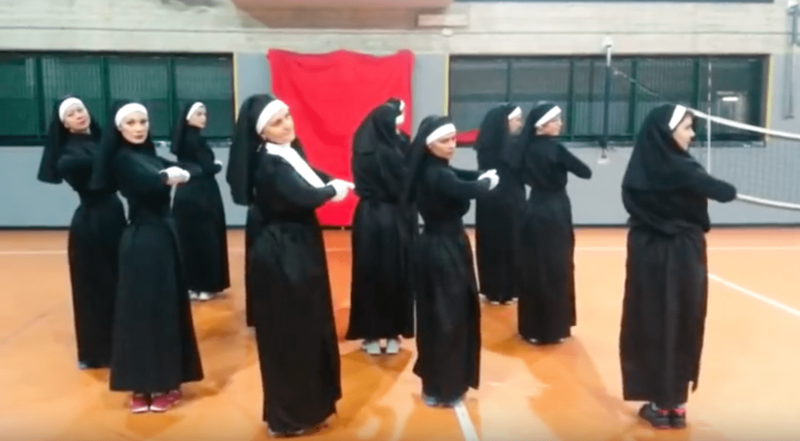 Your friends won’t be able to stop from laughing as they watch these nuns shake it to the beat.